I’ve been wrestling for a good few months with how to take this blog forward. Since I started it in May 2012 I have really enjoyed exploring the wide range of fun and exciting games and stories out there. But recently I have found I’ve lost a bit of the blogging spark – partly down to other writing projects coming to the fore and partly because the way we use apps as a family has changed over time. The blog was always meant to focus on the apps we enjoyed and used the most. As the children have grown and now attend school and preschool, we have less time to share them, and we already have a great number of apps they already enjoy. I don’t want to review apps my children haven’t tested, and I don’t want to dictate to them how to use their screen time, by asking them to keep trying new apps just for the blog. So I think it is time to take a breather for a while. Perhaps I will return later in the year if and when I get some blogging fire back in my belly and find a new balance with our family life. In the meantime, I have a few apps left in the review queue, some of which my children have used and some they haven’t. So I would like to round them up here – all of them are worth a look, so please do read on! First up, we have really enjoyed Jack and the Beanstalk, the latest app from Nosy Crow. It has all the familiarity of their previous fairy tale apps while adding more difficult mini games and an increased sense of being in a “reading game” rather than a story. This is designed to appeal to slightly older readers aged around 6-8 and definitely hits the mark. It’s a fun and absorbing version of the story, up to Nosy Crow’s usual high standards, although Little Miss Chatterbox (aged 4) definitely needed help with the games and found the giant just a little bit too scary. Older children will definitely enjoy it! Love, the App is sure to have a lot of exposure this week. It’s the 2014 winner of the Bologna Ragazzi Digital Prize (Fiction Category), awarded at this week’s Bologna Book Fair to the best children’s book app of the year. Aimed towards older children, and perfect for grown ups too, it’s a beautifully made app using paper-cutting techniques. You have to find your own way through its pages. The sparse story follows a girl who has never known love, and who lives in a tough orphanage environment. The ending shows how she is reaching out for love, and is both heartrending and optimistic. I think it would be a particularly good app to share with older children or teenagers dealing with issues of acceptance and bullying. 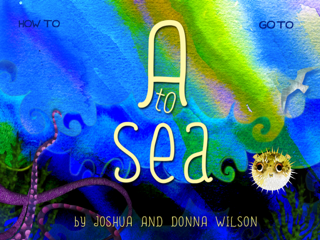 Little Miss Chatterbox has been enjoying A to Sea, a simple A to Z app on a fishy theme. We particularly like the illustrations, using beautiful colours which are really evocative of the sea. It also has a nice structure, with one short description for each letter plus a more in-depth fact for older children, available to swipe up from the bottom of the page. 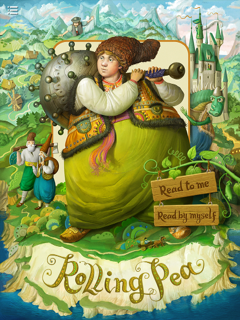 Rolling Pea is a richly illustrated Ukrainian fairy tale about a boy (Rolling Pea) who sets out to rescue his older sister and brothers from a dragon, but finds even more adventures along the way. It is a lengthy story best read together with your child as a traditional book, particularly as some parts are – like all the best fairy tales – a little scary! 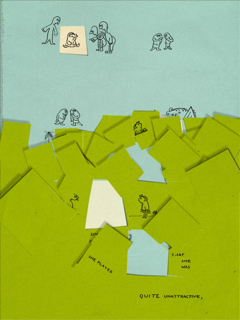 I love the illustrations in this one and the way they are brought to life through interactive elements on each page. 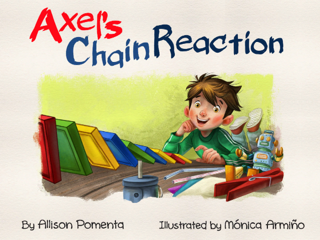 Axel’s Chain Reaction is a story about a boy who struggles to fit in at school but finds his niche in creating kinetic art for a school project. I thought the kinetic art theme was particularly innovative in this sort of children’s app, and it would definitely be very useful in inspiring young model makers to create their own real world projects. 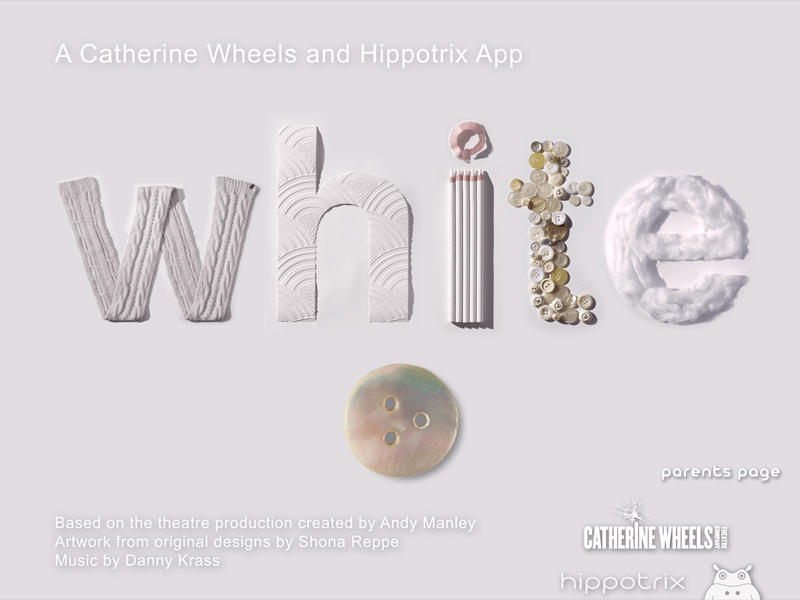 White, the App is not a story app, but a digital toy based on the hugely successful stage show White. It involves playing with eggs and making all sorts of things happen to them in different environments, at your own pace and with no rules. Fun for pre-schoolers to explore – and free until the end of March. Phew! Quite a long list, and I hope you find one or two you would like to try. Thanks again for reading CAppTivated Kids, and please do find me on Twitter @aitcheldee where I am sure I will still be tweeting about apps on a semi-regular basis. I’m still a big fan – just taking a breather on the blog front for a while. All app titles link directly to the App Store. I was supplied with a review code as follows (thank you all! ): the happy dandelion for A to Sea, Allison Pomenta for Axel’s Chain Reaction and KievSeaPirates for The Rolling Pea – this has not affected my reviews which are based on my true opinion after using the apps.